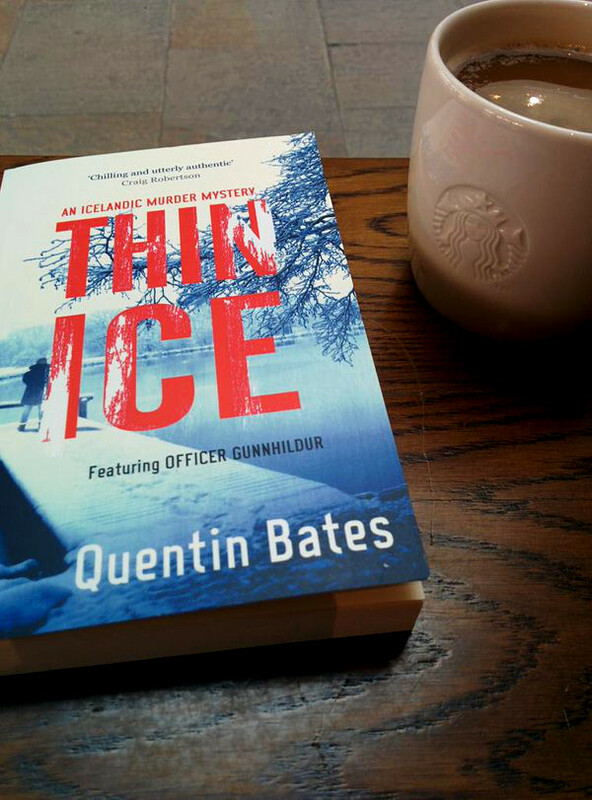 Today I’m delighted to welcome Quentin Bates (@graskeggur to the blog. Quentin was best known to me as the translator for Ragnar Jonasson’s excellent Dark Iceland books, Snowblind and Nightblind. I had no idea that he was (and indeed is) an accomplished author himself, though am not surprised. 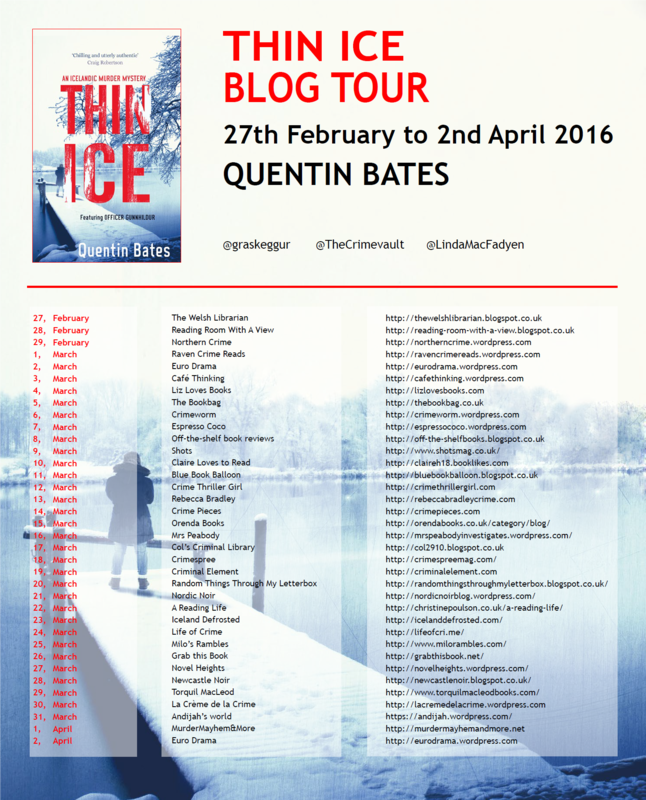 Whilst Thin Ice is part of an ongoing series, it can easily be read as a standalone book in its own right. When two small-time crooks rob Reykjavik’s premier drugs dealer, hoping for a quick escape to the sun, their plans start to unravel after their getaway driver fails to show. Tensions mount between the pair and the two women they have grabbed as hostages when they find themselves holed upcountry in an isolated hotel that has been mothballed for the season. Back in the capital, Gunnhildur, Eiríkur and Helgi find themselves at a dead end investigating what appear to be the unrelated disappearance of a mother, her daughter and their car during a day’s shopping, and the death of a thief in a house fire. Tensions rise between captors and captives and Officer Gunna and her team try to track down the missing women whilst the wonderfully-named Alli the Cornershop and his underworld cronies hunt for the crooks who stole their money. Here’s a short excerpt from the start of the story. I loved the characters of Magni and Össur, both unique in their own special ways. The hard guy in the leather jacket was big, with bulky shoulders and knotted forearms, and his jaw jutted forward as if asking to be punched. So Magni obliged, swatting the tough guy aside with an effortless backhander. He never could resist an invitation; the big man stum- bled back, emitting a high-pitched keening sound as he hit the wall, his dinnerplate hands held to his face as blood seeped through his fingers. Magni felt no animosity towards the meathead who had been stu- pid enough to be in the wrong place at the right time. Or was that the wrong time, he wondered? Whatever, the guy was spitting teeth into his cupped hands and whimpering, so he only needed a casual eye to be kept on him. Nothing to worry about, Magni decided with satisfaction. At any rate, the ugly black pistol in Össur’s nervous hand was far more persuasive than mere muscles. The old man’s face went pale, paler than it normally was, and Alli the Cornershop didn’t look like a man who spent much time in the sun. He looked sick as he handed over a carrier bag that Össur glanced into before tucking it under one arm. Perfect for fans of Icelandic Noir and Ragnar Jonasson. I’m going to have to go back and catch up on the back story of officer Gunna! Many thanks to Linda at Constable for the review copy. Thin Ice is out now.